You and your team have done manhole installations in the past. But they have been tough and tedious. How is a Lifespan installation different? Watch and see! 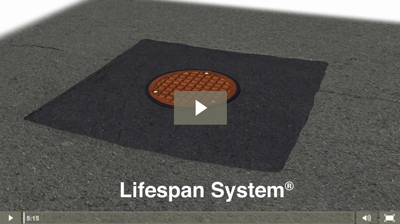 In this 3D animated video, you will learn how to properly install the Lifespan System. Most importantly, you’ll get a quick introduction to how simple an installation can be. Opt-in Please provide your consent to receive emails from Hamilton Kent. By submitting this form, you grant Hamilton Kent permission to contact you with additional information and educational resources specific to your area of interest. You may unsubscribe at any time. This video demonstrates the most common manhole structure: one made of concrete that uses precast concrete grade rings. *This also shows the installation steps required for an on-road application. An off-road installation does not require any adjustment risers. As shown in this video, two beads of butyl are applied directly on the structure before the frame is installed. This installation demo also assumes the seating flange of the precast concrete grade rings is at least 5”/125mm wide. If your installation practices or available materials differ from this, please consult with your Lifespan System representative before beginning your installation. Want to get started on your own Lifespan installation? Contact us.